Magic Factor Media is an FAA Section-7 certified UAV (drone) operator. We provide high-quality aerial photography for a range of clients including developers, luxury real estate agents, outdoor apparel companies, agriculture and many more. 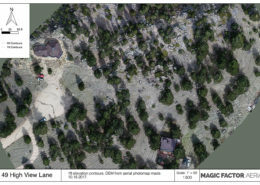 We also provide georeferenced aerial photo maps and work with surveyors to tie in ground survey details where needed. 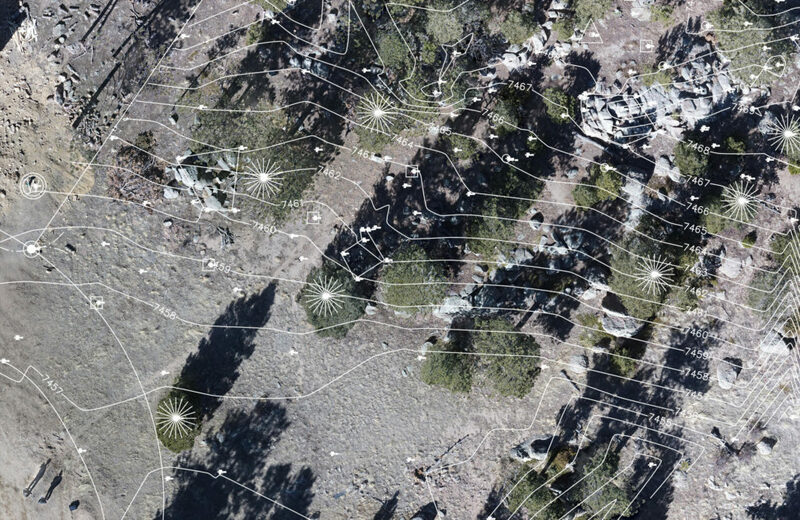 Contact us to discuss your aerial photo and mapping needs. 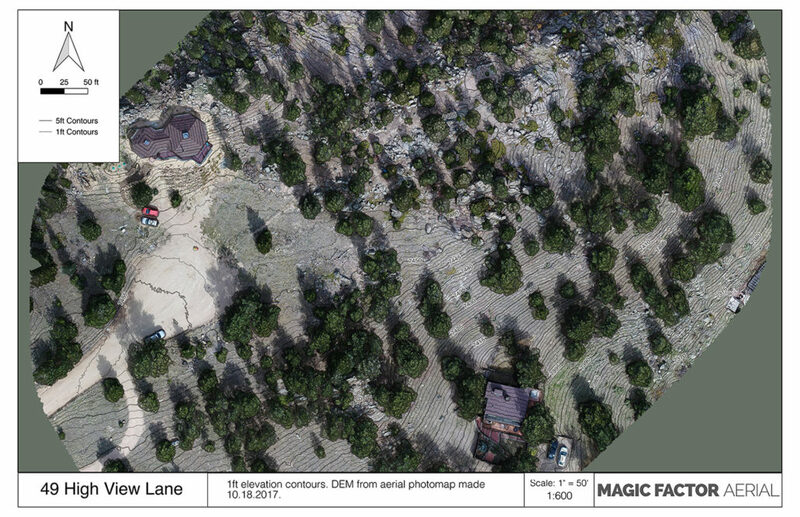 Our aerial mapping gives you high-resolution orthographic images with detail far beyond satellite imagery, and is up-to-date. 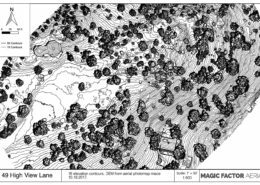 Our process involves flying a grid pattern over the area, shooting hundreds or thousands of images which are then analyzed and stitched together to form an orthomosiac map- a straight-down flat, correct vsual mapping of the area. First, see the finished maps that were made from this project. 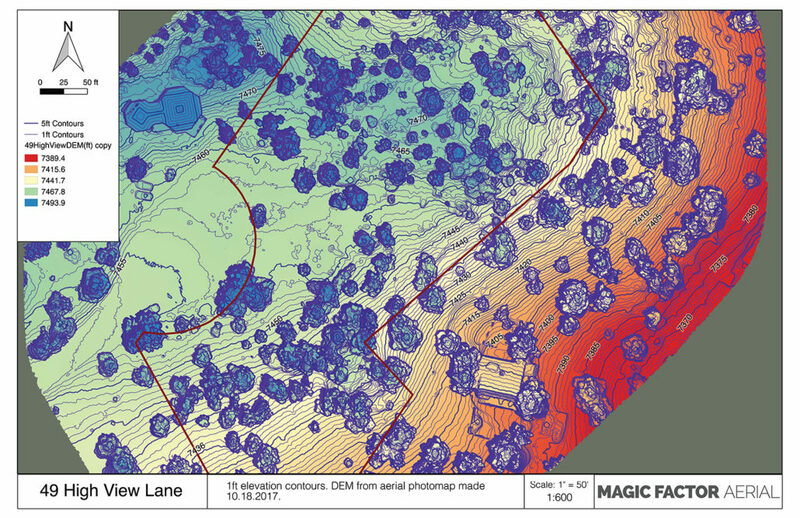 We are able to extract digital elevation data and create contours which can be overlaid on the photo map, a colorized elevation map, or simply presented as a topo. 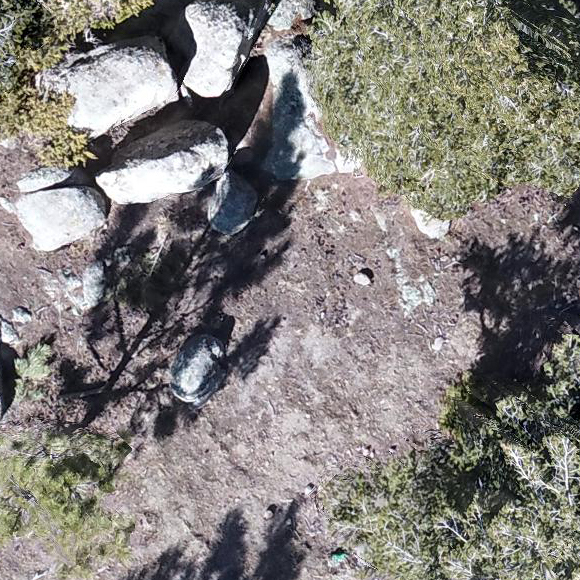 Notice that the detail is extremely fine, since the photo analysis uses thousands of points to determine elevation. Next you can see an online, embedded version of the interactive map below. In here you can zoom into see the detail at 100%. With a resolution of 0.46in/px, you should be able to make out details that are only an inch or two (several pixels across). You can also use the measuring tools to find lengths and areas, and create markers. Near the edges of the mapped area (which is ‘oversprayed’ from the desired target area) you can see how much more detailed it is than the satellite data. Depending on the terrain, it is possible for us to get resolution of about 0.2 pixels/inch. 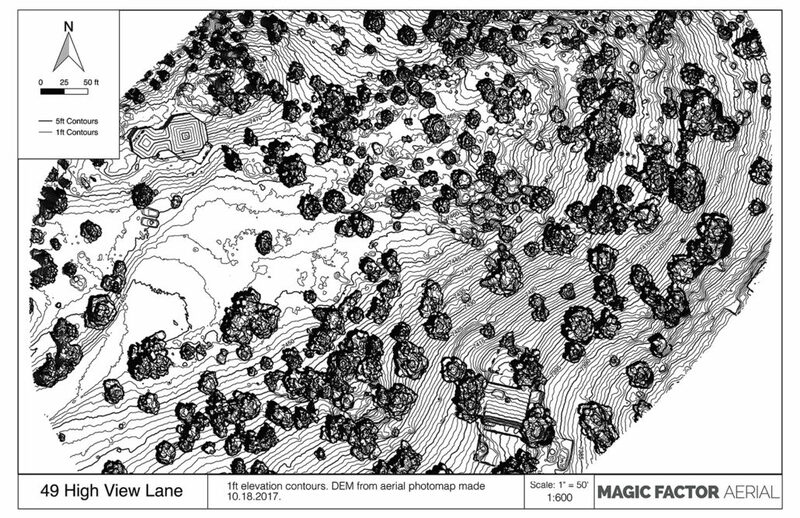 The images below show some comparisons between this map and Google Earth, both at 100%. Since our map can go closer, it is zoomed in more. 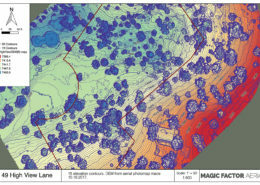 Since the map shows so much detail, we can lock in to ground survey points and provide additional data. 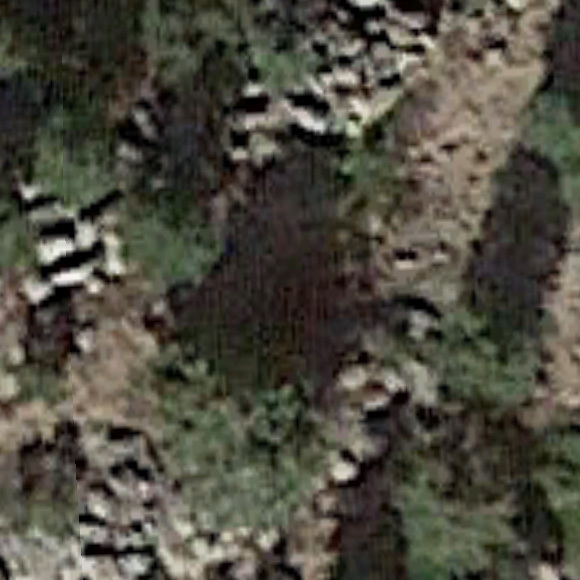 In this case, a ground-surveyed topo map is overlaid on the orthomosaic image map. Here you can see a detail of the topo overlaid on the image map, where 2 survey pins with the marking tape are visible. 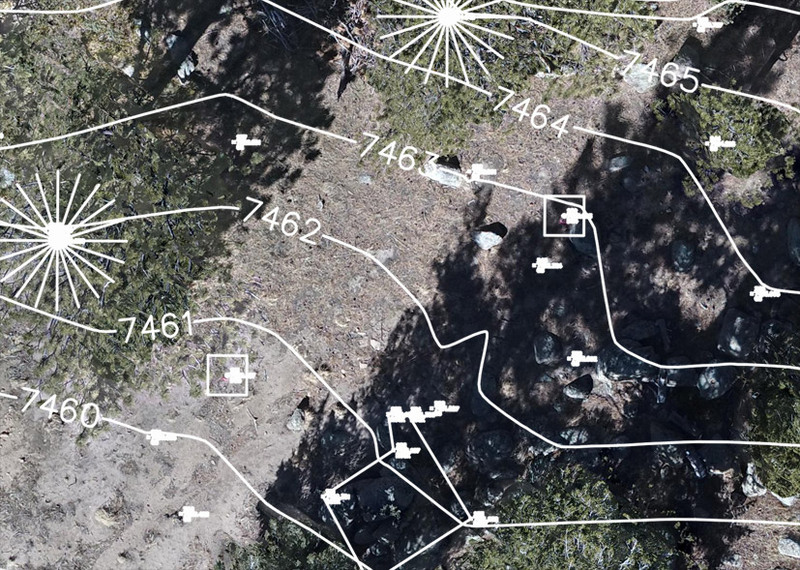 A minimum of two points are needed to lock in the overlay properly, but in this case we had many points- pins, paint spots, trees, etc that were surveyed. See the interactive aerial map, with measurement tools, in its own window HERE.